PR for or against good and safe practise in AMAT???? It is a pity, that some products of this project, which was not carried out in the planned and agreed way by all partners, based on personal opinions of some participants only and not on on facts and scientific apporved surveys, are published connected with AMAT sometinmes as well as with SHP. We consider this not good PR for AMAT, because it is showing precisely the bad and unprofessional practice in working with horses and humans and brings correctly working organizations with highly developed standards and very well qualified prviders in problems and disrepute. This does not support AMAT being recognised as an effeicient, effective and scientific and evidence based form of therapy. SHP has learned a lot from this partner project and is preparing a publication on the carried out analyses on the collected data and conclusions for the field of AMAT. Professional work is rare in this field and unpofessional work is very often published with a lot of emotions lakking a real scientific working base, safety standards and ethical code towards client an horse. The publications and products of this project are examples for this situation. SHP is not apporving the distribution of a folder being declared as an outcome of this partnership, because it represents poor and unsafe quality of work in AMAT . Further SHP found out that a lot of submitted materials, which should be used for the common approved development of a kwalification framework by all partners was used and published wihout correct citation and permission. Members of our organization should have been part of the PR working group but where systematically been obstructed. So the cooperation did not come to a certain level. We did not receive the drafts of the folder in order to discuss it with the other partners. When being confronted with the finished folder it turned out that .the PR group without our participation seemed to have developed a folder to which we could not approve because of lacking of safety measures and not representing the practice of all partner organizations equaslly and the state of the art and good practice in the Netherlands. SHP had supported the PR group with 65 approved photographs being checked on safety, practise, quality of work and well-being of horse and client according to the SHP guidelines to represent her way of working in the folder.The PR group only used one of the submitted photographs and filled up with photographs of unknown persons, not educated by SHP or being member of SHP from NL which where not at all representative for the work of SHP, not meeting their standards, but where published under the name NL. 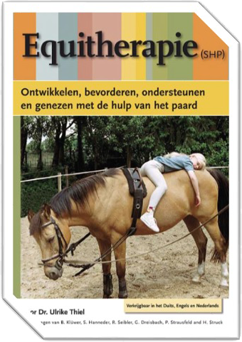 So people would take these fotographs as representative for the work of SHP, being published as partner organization in this project .in the folder.The only used photgraph showing the head of the SHP Equitherapist's training is used in a context not fitting to the SHP vision and guidelines. After the other partners refused to change the folder according to our comments together we asked them to publish it without our name and logo named in the folder. Afterwards it turned out that they did not respect this agreement made at the 5th meeting. Now a folder is circulating by web publication and on paper, with our Logo and name on it, which suggests that our way of working is according the published folder. This fact is damaging our reputation strongly. On the other hand the German partner published an article on the project not naming us as a partner at all well using a lot of our contributions and productions in the project. This problem has not yet been solved. Another problem turnig out during and at the end of the project was, that ..
A lot of materials, we submitted to all partners such as a draft version of the not yet published Book Equitherapy(SHP) for internal use within the project, where used without citation and was even published openly on the homepage of the coordinator being accecable for everyone. The fact, that this project was done under guidlines of the EU Da VInci did not withdraw partners to use and publish information without our permission.So alot of material being submitted by SHP to use together in a common framework was misused without permission for emotional PR and other targets.